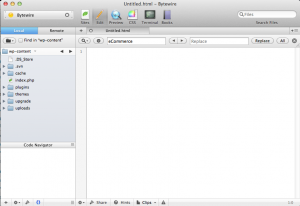 Having recently converted to Mac as you may have read in a previous blog “Moving from PC to Mac” we decided that it was also time to look for a new Text Editor to use for programming. The first code I ever wrote I used a basic Text Editor which has no tools to assist you, a great way to learn how to code if your a beginner, since then I used Macromedia Dreamweaver but have never been fully satisfied with the way it works. Macromedia, being such a big company, can often mean less effort is added to the product to make them as good as they can be. So in search for a new Text Editor which can be used on Mac’s I came across Coda, made by Panic. I have been using the software for a week now and I am impressed. The software is $99 but you do have a trial period to test it out and see if you like it. The staff at Panic appear to be interested in ideas to improve the software further so if you have any suggestions its worth dropping them an email.